I wasn’t sure how I felt about the idea of shrimp & grits mainly because of the grits. I’m sure I mentioned on here before I have issues with texture and certain things just bug me to no end. Gritty feelings is definitely on my texture no-no list and since grits are well, gritty, I wasn’t sure how I was going to feel about this recipe. But the picture in Cooking Light looks awfully appealing and time was quickly winding down for me to make these before I turned 28, so I decided to bite the bullet one night and go for it. 1. Bring the water and butter to a boil in a medium saucepan. Whisk in the grits, cover and cook for 5 minutes, stirring frequently. 2. Remove from the heat, stir in the cheese and season with salt and pepper. Cover again and set aside, keeping warm. 3. In a large skillet, cooked the bacon over medium-high heat until crispy. Remove with a slotted spoon to a paper towel to drain. 4. Add the onion, garlic and mushrooms to the skillet and cook for 8-10 minutes, stirring frequently. 5. Add the shrimp and crushed red pepper flakes to the skillet and cook for 3 minutes or until shrimp are pink. 6. Combine the half-and-half and flour in a small bowl, whisking until smooth. Add the mixture to the skillet, along with the chicken broth and cook for 2-3 minutes or until thickened. Season with additional salt and pepper to taste. 7. 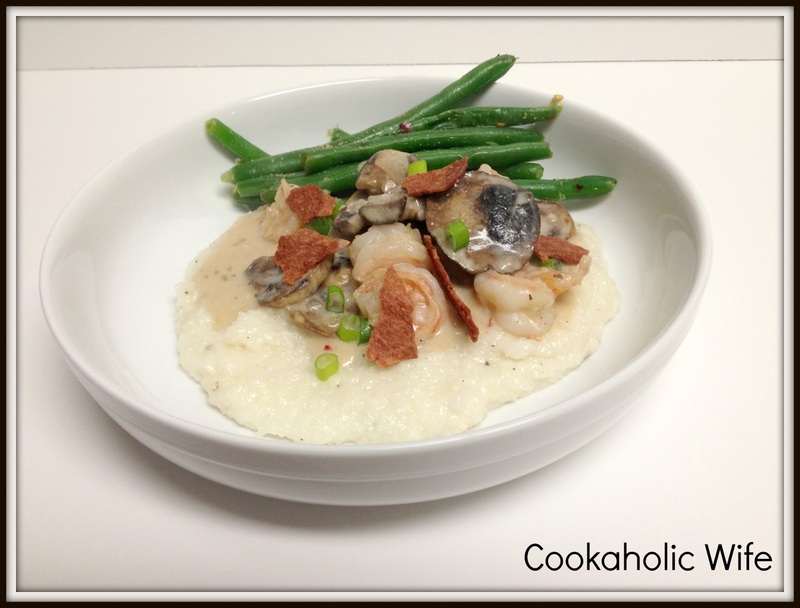 Spread grits on plate and top with shrimp mixture. Garnish with diced green onions. Holy cow is this an incredible dish! The mushrooms and onion add a huge amount of depth to this meal and the cream sauce pairs wonderfully with the grits, something else I wasn’t expecting. I am definitely going to make this again!